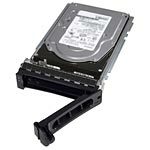 Increase the storage capacity of your Dell System with this 2TB SATA 6Gb/s 7.2K RPM 512n 2.5" 13G Hot Plug Hard Drive. It boasts a storage capacity of up to 2 TB, enabling users to store large amounts of data. Featuring Serial ATA interface, this hard drive delivers enhanced data transfer speed of up to 6 Gbps. Offers up to 2 TB storage capacity. Equipped with Serial ATA interface which delivers high data transfer rate. 7,200 RPM spindle speed ensures excellent performance.